Every mother wants the best for her child.We all as mothers sometimes, have been under a panic attack when it comes to picking up baby products.With numerous brands flooding the market this task gets all the more difficult.As we all know a lot of companies claim to be perfectly ayurvedic when they are not.But taking such a chance with a baby’s products are a big NO NO. In references to the classic formulations as described in Ayurveda have been undertaken with blending of modern amenities to maintain appropriate proportions of the active ingredients present in the herbs. With due course of intense studies and research, here in Mother Sparsh a long range of quality derived Ayurvedic products have been launched which covers skin care, intestinal colic disorders, herbal tonics, body massage and baby wipes. Their breakthroughs are gentle and holistic that serves as a best friend to your baby to rejoice her early life with full joy, fun, intellect, and strength. I was quite impressed with the packaging.The soap was in a sturdy cardboard box and inside covered with a plastic wrap separately.The wet wipes came in a thick plastic packing which was again very nice.The lotion came in a tube whereas the lal tail was in a bottle.The team at mother sparsh follows a green theme that is evident from the packing.All the products had a green cap to them.The caps locked very easily after use making them travel-friendly too. Best for Baby’s Play time, Meal time & Potty Time. I have been using these wipes on my baby since the past 1 week and trust me when I say that they are actually just water.As they claim that their wet wipes are made of 98% water.I must say they are correct when they say this.I use them to clean my baby’s face, hands.They are very handy when we are travelling because just a swipe of it cleans up my baby perfectly.I am really lazy so I too sneak out some of the wipes to clean my makeup at night.And it does the work to perfection. This soap is amazing.It cleans the skin gently while mildly moisturizing it too.It lathers up quite well.The soap is enriched with the goodness of olive oil and almond oil both of which individually too are amazing.The soap has a very nice fragrance, not too strong but it lingers on to the baby skin even after a bath.I love it. The baby lotion just like other products to has a very pleasant fragrance.It is super moisturizing on my baby’s skin.A little amount of it too does the job.With the baby, every mother’s hands tend to get dry because we literally wash them 100 times a day.I too tried the lotion on my hands and it did the job pretty well. Sesame oil is enriched with essential vitamins like E, B complex, D and minerals like calcium, phosphorus etc. Made of Ayurvedic herbs and herbal oil. 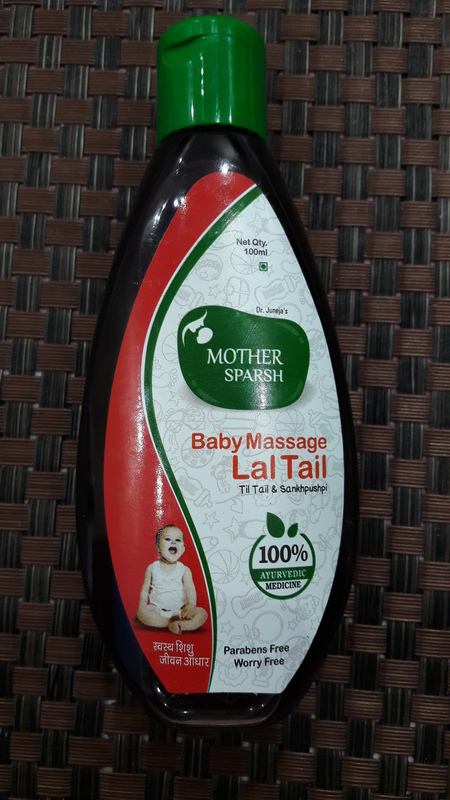 Helps to improve skin glow, reduce dryness and soothes skin.I make a point to massage my baby’s legs every night with the same oil and she seems to feel very relaxed.It has a strong pungent smell which is obvious because it’s a lal tail. I would definitely give it a thumbs up and recommend it to anyone who is looking for ayurvedic products.They are easy in the pocket, meaning fairly priced and also are great and healthy on the skin.You definitely as a mom don’t have to worry if you choose mother Sparsh. I hope this review was helpful to you all. I love their water wipes..want to try their gripe water for my son…have you tried it?